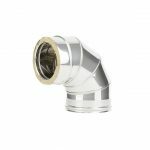 Our double wall, insulated flue piping is created from the best quality 304 grade stainless steel (304SS) which is non-magnetic and can withstand the corrosive chemicals produced by closed combustion fireplaces in the long term. Keeping the exterior of the flue pipe cool no matter how hot your fire, the insulation inside the double wall flues ensures that no combustible materials nearby catch alight. Because of this added safety, insulated flues are vital to in the cavity between your roof and ceiling, where it’s hard to visibly monitor any possible dangers. Our double wall stainless steel flues are sold in universal sizes of 0.4mm and 0.5mm and are suitable to use with all Hydrofire fireplaces and boiler stoves, as well as units from most other suppliers. Readily available in the usual stainless steel silver, at a small extra cost we can also spray your single double wall piping matt black, which looks very discreet and sophisticated.